You are setting a good example for your child! You automatically increase your social network and meet new parents! You are in the know! Parents that volunteer are physically around and naturally going to learn about what is happening at school! School Store - We offer a parent-run school store in a dedicated room in the cafeteria. We need parent volunteers to staff the store for 1.5 hour shifts during lunch Monday through Friday. If a parent does not volunteer, then unfortunately the store cannot open. Come on your own or sign up for a shift with a friend. Sign up HERE Thank you! Spirit Wear - We could use your help selling and organizing spirit wear items at PTA events throughout the year! Staff Appreciation - Help set up at a Staff Appreciation event! Social Events - Dances, Skate Night, Talent Shows, Theatre productions and the Taste of Hoover are a few of the events we need help selling tickets and staffing the door. 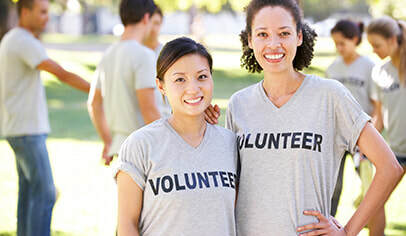 This is a great chance to volunteer with a friend! Please contact Linda Young if any of these opportunities interest you. THANK YOU IN ADVANCE TO ALL OF OUR VOLUNTEERS! Hoover reimbursement - Committee Chairs should use this form for reimbursement of expenses per their budget allowance and Board approval. PTA cash verification form - This form is used to tally & record cash and check deposit totals.